It rained early this morning and looked like it was going to be crap all day, but mid-morning the sun started peeking out (to the dismay of BF who was not feeling quite up to it that early due to a few martinis the night before). So noon we took to the road. BF, Homey and me. BF mapped out a new route instead of the down and out that I find very boring. And to my surprise it was really flat (insert sarcastic tone here). See the elevation map below that shows only one hill that needed a little extra oomph to get up. It was OK though as Homey hadn’t ridden since the Tour de Cure. He looked good though. He had some nice steady pulls throughout. I tended to stay beside him whenever the road allowed so I could chit-chat with him. So I didn’t really draft off him half of the ride. Although it is nice after having pulled a few times to sit in back of the pack and coast while someone else pulls you. Even BF pulled…..twice (maybe 3 times). Toward the end of the ride BF was so invigorated from sitting in back that he nearly pulled away from Homey and I upon taking the lead. I had to really work hard to catch him. When asked where he got all his energy, he said that he was just trying to keep in front of us and almost fell over from over-exertion. I still had some good energy left at the end of the ride. Still, 35 miles was enough for today. Here is the course detail. 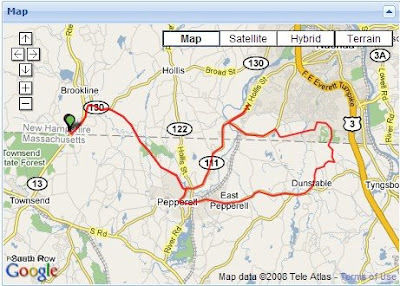 We went 34.72 miles in 1:52:13 ride time averaging 18.6 mph for the ride. At one point I hit a max speed of 36.4 mph. 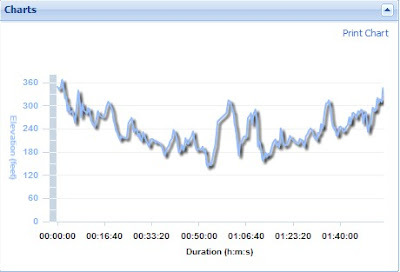 My Garmin had a total pause time of only 3 minutes. This was faster than last Saturday’s ride but then again that was a leisure ride and today was flatter and serious business. After I got home, we lost power and it started crazy storming…lightning, thunder, heavy downpour. Hence the title of the post. We got the ride in. 2 comments to In between…just right! It was an excellent route. I liked it. Good job BF. That was a solid ride. I liked the route and perhaps next time we can add in some more hills. Good timing on your part as it rained wicked F’ing hard here later.